I finally found a way to do product photography with the new lighting! Oh, this is such a joy. Today's post is really just an extension of the previous one, and a chance to profile one of those amazing reds we find from time to time. 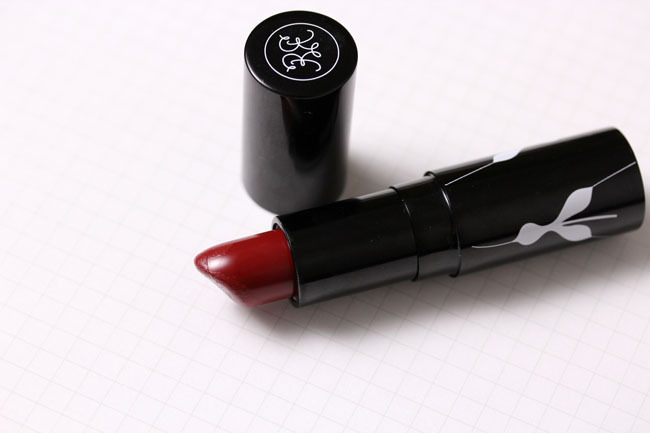 Rouge Bunny Rouge Color Burst Lipstick in Raw Silence is so unabashedly and delectably red it's almost criminal. The smooth, creamy formula makes it very comfortable to wear, but it's not so creamy that it slips and slides around the mouth. It was a no-brainer to pair this cool red with a crisp white shirt and pointed cat-eye. Rouge Bunny Rouge products can be found on Zuneta (worldwide) and BeautyHabit (US residents). The color must be in high demand, because it's currently not listed on Zuneta and is backordered on BeautyHabit. please share the secret of your new voluminous hair! Love how graphic this look is (including the smart shirt and tie). 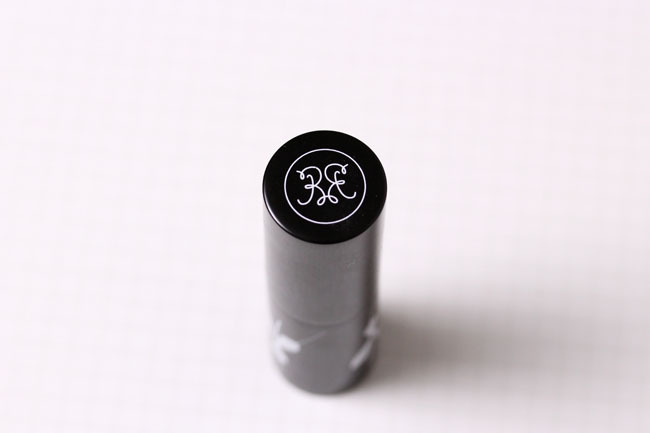 Rouge Bunny Rouge lipsticks have a wonderful smooth formula. And I agree, this is a beautiful red! Absolutely beautiful on you!! I still have yet to try anything RBR, but I have a growing list of things to try from the brand and this will go on it too. Thank you for the gorgeous pics! I really love your pictures because you have the face of a supermodel! 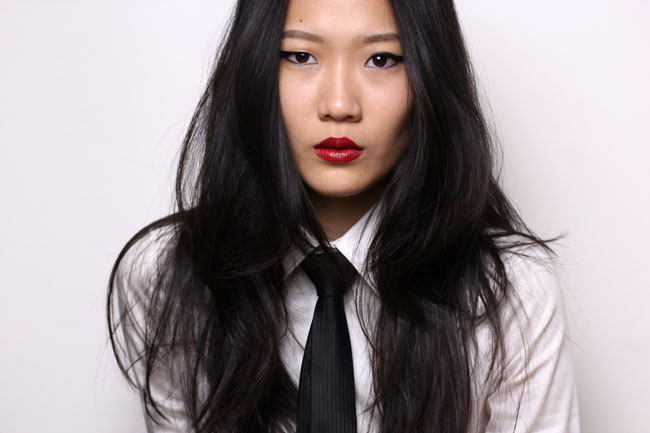 You kind of remind me of Liu Wen. How do you afford all these luxurious brands? Envy! I want to know about hair, too. I'm trying to pay more attention to mine as it's feeling sadly neglected (i.e., dry as hell) and I want to remedy this. I died when I saw the tie on you. 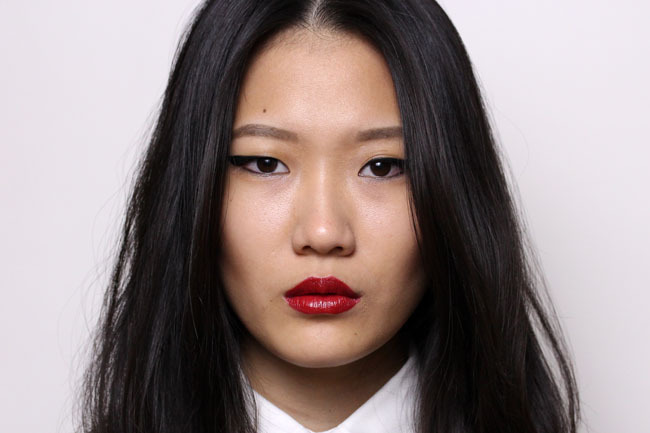 What a fantastic set of photos, and of course a fantastic red lipstick. Gorgeous red... and the hair! Like everyone I want to know who your stylist is. I can only say, so modelesque! Does that adequately convey my feelings? I've always had fine hair but lots of it but somehow it's decided, or at least some of it has, to have waves (not the font though darn it). Weird. I realized I have this lipstick so I just put some on. It pulls a little warm on me actually I'd like it to be more blue but it's so comfortable on and pretty in any case. Holy crap, Xiao--this is some serious supermodel sh*t!!! :P Haha you look great girl! itsykitsy- I *really* don't do anything to it except occasionally blow drying upside down! But I'll try to write up a post soon. Rae- I love it when you geek out! All such valuable information. Please never stop. Larie- Hahaha but Armani reds are pretty! I just try to alternate my washing days as much as possible and use a heat protectant when I blow-dry. In fact I've been avoiding hair oils/serums because Geekz told me it may cause bacne. Claire- I know which colors don't (warm pinks, usually) so I tend to avoid them :) I think reds look good on everyone, though! Angela- makes me want to go out and buy MOAR TIES! eleanor- I never took down their names, unfortunately >< But I religiously go to two salons: Hisako in New York and Enzo in Boston. I own this lipstick, too :) It really is lovely, I should wear it more often. you look so fab, love the lipstick shade. Would you like to follow each other. Plz let me know! !